With 85 years of floristry at their green fingertips, Hayford & Rhodes are arguably the ‘go-to’ for any bride seeking the perfect blooms for their special day. We were invited for an afternoon at Hayford & Rhodes studios in London Bridge to try our hand at the envy inducing art of floristry, complete with sumptuous treats by Alison Price including, miniature red velvet cupcakes complete with sugared flowers (very on-theme), finger sandwiches and scones, all served on boxes filled with English garden creations. 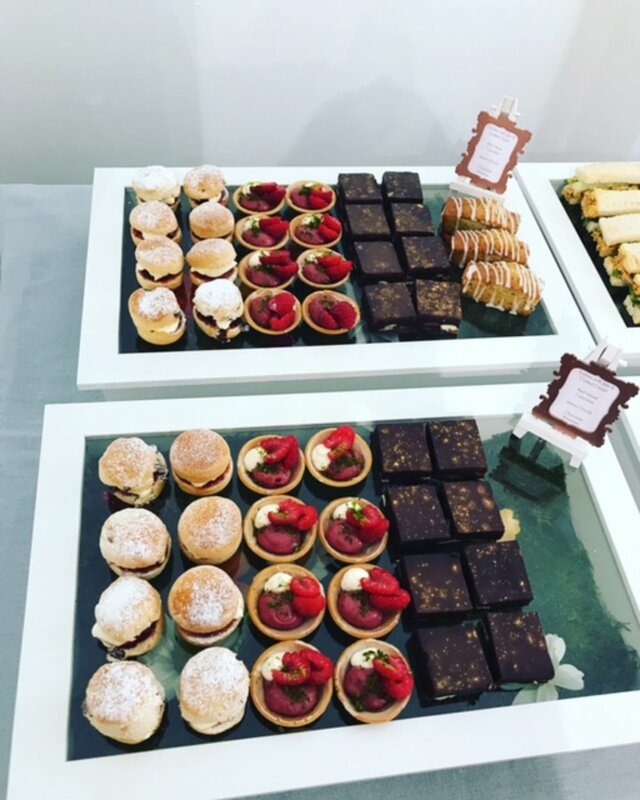 Glass of bubbles in hand and with one of Price’s delectable salted caramel brownies for sustenance, we were all set for an afternoon of floral magic. Joanna Rhodes, one of the three sisters who took over from Hayford florists in 2007 gave a demonstration worthy of any BBC presenter. 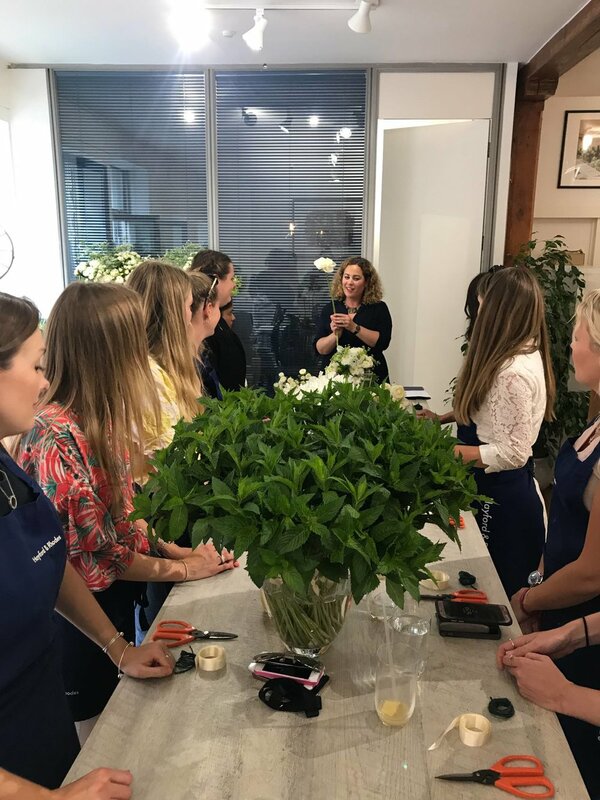 Talking us through each stem and explaining the importance of romantic and relaxing scents on a day when a bride will undoubtedly be full of nerves. 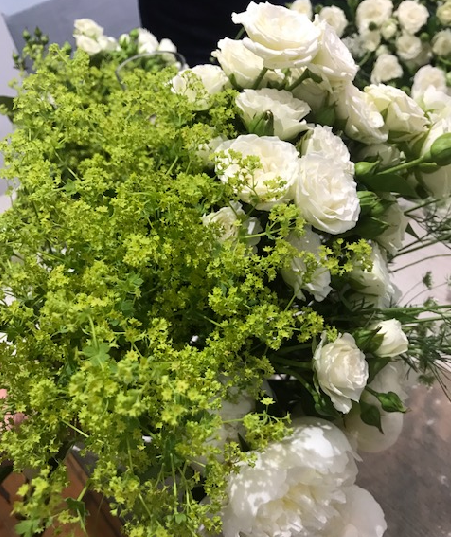 Joanna deftly picked up delicate stems of dill, lush spears of mint and vibrant green Alchemilla Mollis which despite its intimidating name was a beautiful lime green flower which as Joanna predicted brought out the fresh whiteness of the Peonies, Sweet Peas and Spray Roses. With a twist and a flourish, Joanna stood at the end of the room with a spectacular bouquet in her hand. She announced it was our turn, and with sleeves rolled up we each picked up our stems and set about the seemingly monumental task of attempting to recreate the stunning floral globe that stood at the end of the table. Repeating Joanna’s advice like a mantra, we spun our bouquets searching for gaps, placing the more delicate stems towards the center and attempting to avoid the awkward symmetry that Jo advised fails to capture the eye. The bouquets began to transform from awkwardly held handfuls of green and white to become event worthy masterpieces, with some in the group having a more boho wedding in mind and others clearly envisaging a Middleton worthy bouquet. We managed to avoid getting tangled in string and tape as we were shown how to tie our bouquets and attach ribbon with delicate pearl pins to fasten everything in place. Voila! We finally stood with a somewhat impressive bouquet in front of us. A little haphazard in areas and certainly not the masterpieces created by Hayford and Rhodes, nevertheless following our first foray into floristry we proudly emerged into the sunshine, bouquets in-hand with everyone reveling in a new-found passion for flowers and floristry.